It’s time to return to the world of Gamindustri, as Neptune, her fellow CPUs and their little sisters face a new challenge. 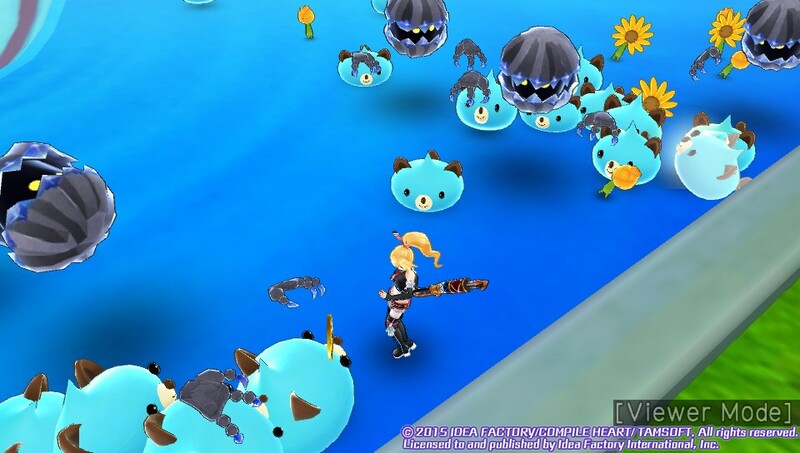 Swapping action RPG for just plain action, the girls head out to fight off wave after wave of incoming monsters and oversized bosses. Joining them are two brand new faces – Dengekiko and Famitsu – rival journalists who think that tagging along with the CPUs might just give them the exclusive scoop they need to launch their careers. 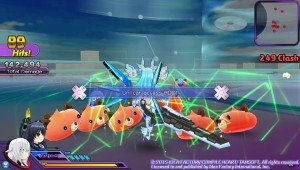 The Neptunia franchise has been throwing remakes and spin-offs fairly relentlessly over the last year or so, and this time around we are treated to an action game in the vein of Dynasty Warriors and its brethren. 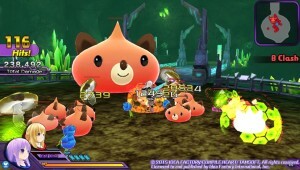 The game is divided into a series of increasingly challenging missions, with the aim usually revolving around mowing down wave after wave of smaller enemies and oversized bosses. The girls all wield their trademark weapons from the main series to devastating effect, and as per usual they can transform into their ‘HDD’ forms and perform special attacks for extra damage. Most missions also let you take two girls along, letting you swap between them so that one can rest and recover whilst the other is dealing the damage. 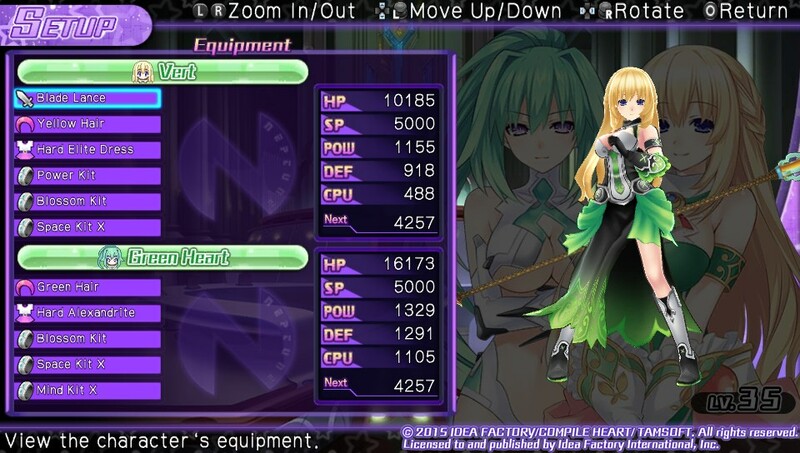 Since the game is from the makers of Senran Kagura, it also comes with a mechanic in which the characters’ costumes rip if they take too much damage; however, it is so easy to unlock unbreakable costumes as you play that you can effectively ignore this if you like. As usual, there’s a very thin ‘plot’ tying things together, but it’s easily ignored, as the bulk of the game is just “beat up monsters, level up, rinse and repeat”. Although replaying missions seems to be encouraged for the purpose of upping your high score or collecting medals which can be exchanged for power-ups, the missions are so similar that only the most dedicated player will feel inclined to do so. 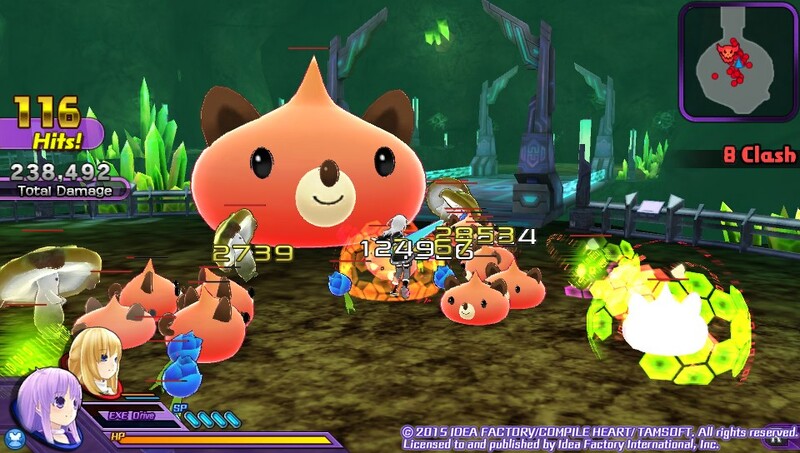 There’s been a small effort to introduce variety with ‘irregular quests’ where the clearing condition might be to perform a particular type of attack to win, but these are few and far between compared to the ‘beat up X enemies and Y bosses to win’ formula that 90% of quests take. Couple this with the small size of level maps and a learning curve that goes from easy to tedious rather than easy to challenging, and Hyperdimension Neptunia U is definitely a game to be enjoyed in short, button-mashing bursts rather than extended sessions. 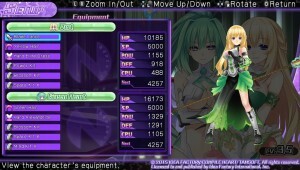 As you might imagine, Hyperdimension Neptunia U: Action Unleashed reuses a lot of assets from the Re;Birth Vita remakes of the main series, with the result that all the music, locations and character models will be entirely familiar to fans of the series. Whilst this is no bad thing, it does feel like the developers have missed a trick in not including more of the numerous playable characters from the main games – it would have been fun to have had the chance to cut loose with IF’s claws or Compa’s oversized syringe. Although it won’t win any prizes for originality or depth, Hyperdimension Neptunia U is a fun button-masher that’s good to dip in and out of. Whilst there are better titles out there for the average action gamer, fans of the series will get a lot of entertainment out of this one.